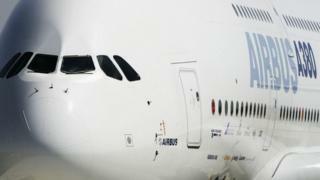 Image caption UK-based Airbus staff made 18,000 visits to the company's French operations alone last year. In a speech at a business festival in Liverpool, Business Secretary Greg Clark today insisted that services must be part of any Brexit deal with the EU and issued a series of demands. UK employees servicing EU customers must be allowed to travel just as frictionlessly as the goods that have dominated the negotiations so far. Professional qualifications of UK workers must be recognised in the EU to allow companies to send qualified staff at short notice to perform business-critical functions including training or installing, servicing and repairing products sold to EU customers. UK firms must also be able to send any profits generated by services delivered in the EU back to the UK. Services account for 80% of the UK economy, and the UK sells more services to the EU than it buys. Mr Clark said: "Over the years, we've become used to these arrangements. But they don't happen without agreement. "So, as we leave the European Union, this is every bit as important as avoiding barriers in manufactured goods." To date, negotiations have focused on the frictionless movement of goods between the UK and the EU. Services are every bit as important - if not more, according to Mr Clark. He said: "£90bn of services exports went to the EU in 2016. That's more than to our next eight largest partners - the United States, Switzerland, Japan, Australia, Canada, China, Singapore and Norway - combined." I put it to him that the UK government was in a weak position to start issuing demands when it couldn't make up its own mind on key issues like the kind of customs arrangement it wanted with the EU. Two years on from the referendum, two models are still being considered. First, the maximum facilitation (max fac) model which envisages using new (unspecified) technology to reduce friction at our ports, airports and, crucially, at the border between Northern Ireland and the Republic. Second, a new "customs partnership" that would see the UK collecting EU tariffs on goods bound for European markets on the EU's behalf - and sending them on to Brussels - with the option of paying refunds on goods remaining in the UK. The first option will cost UK business up to £10bn per annum - and £20bn in total for both sides - according to HMRC. It's a calculation not disputed by the business secretary. The second has been dismissed as unworkable by the EU, which says it would essentially make the UK a border authority for a bloc of which it was no longer a member. Privately, Mr Clark acknowledges that either option would take many years to implement - certainly longer than the agreed transition period which ends in December 2020. What Mr Clark's intervention today does illustrate is the very grey line between goods and services. When Rolls Royce sells an engine to an airline it usually does so at a loss. The company makes its money on long term maintenance, inspection and repair contracts that can last decades. Selling the engine is the start - not the end of the deal. Getting skilled workers to customer sites at short notice is essential. UK-based Airbus employees made 18,000 visits to France alone last year. The company runs its own air shuttle between Broughton and Toulouse. According to Mr Clark: "Restricting people's ability to travel at short notice would be as damaging to our economy as frictions and disruption in the transfer of goods at our borders." The simple answer to these issues would be to remain a member of the single market and the customs union as many businesses have recommended. That option has been categorically ruled out by the Prime Minister as it would prevent the UK striking new trade deals with non-EU countries and it comes with accepting the free movement of people between the EU and the UK. An option Mr Clark accepts is politically impossible.